Former president George W. Bush won't have to answer questions about the site of his presidential library. An appeals court overturned a ruling Friday that would have put former President George W. Bush under oath in a dispute involving his presidential library. 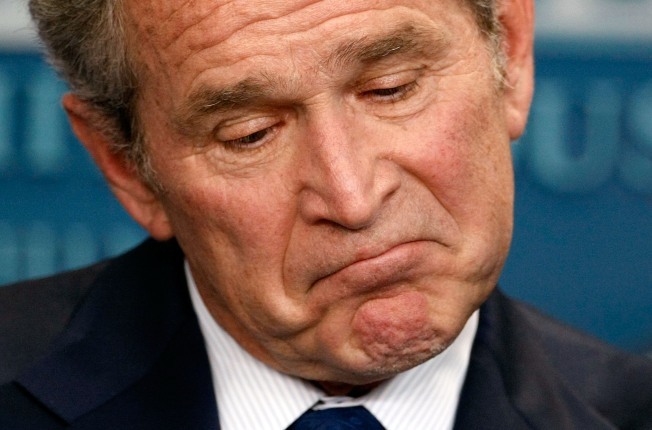 A three-judge panel with the 5th District Court of Appeals in Dallas ruled that Bush does not have to submit to a deposition from a former condo owner suing Southern Methodist University, future site of the presidential library. Gary Vodicka, who was forced out of his condominium by SMU to make way for the library project, contends the university coveted the property as the future site of the library and lied about its intentions. A Texas district judge had ordered the former president to appear at a deposition in Vodicka's suit. The order for compelling Bush's deposition was historic: No sitting or former president ever has been forced to testify in a state court proceeding. The appeals court acknowledged that taking a deposition from a former or sitting president is an "extraordinarily rare event," and found the case did not meet the standard associated with presidential testimony. Its ruling overturning the district judge's order states that "it appears Vodicka himself is unclear as to why he needs the deposition of President Bush." Vodicka, 49, vowed to ask the appeals court to reconsider and said he will also appeal to the state supreme court. The ruling Friday was "all about Bush and his stature" and not about the law, Vodicka said. "I don't care whether he is the president, the former president or a garbage collector," said Vodicka, a lawyer who is representing himself in the lawsuit. "He ... participated in the most significant discussions regarding where his library will be located." A spokesman for the former president referred questions to John Martin, one of Bush's attorneys. Martin said he was pleased with the ruling, and characterized it as an affirmation that "there is no basis for taking the depositions." Vodicka's lawsuit centers on SMU's acquisition of University Gardens, a run-down, 40-year-old condominium complex across the street from the university. SMU decided at the end of 1998 to begin buying up the approximately 350 units. The school eventually bought 97 percent of the units, much more than the 75 percent needed to gain control of the board of the homeowners association. It stacked the board with SMU employees and others affiliated with the university who did not own units or live at the complex. The holdouts were Vodicka, who had four units, and another man with a single unit. The school bulldozed the condos in 2006. Later that year, it became apparent SMU would be the site of Bush's library. The land upon which the condos once sat will be part of the library grounds. Officials hope to break ground on the project next year and open it in 2013. Vodicka alleges that SMU breached its legal duty to the other condo owners by letting the place fall into disrepair so that it could be torn down. He also says school officials began angling for the presidential library as far back as 1998, when Bush was governor of Texas and had not announced his candidacy for the Republican presidential nomination. He contends the school acquired the condo property with the library project in mind. SMU attorneys said "Bush was not involved at any level in SMU's plans ... to acquire the University Gardens property." Vodicka turned down $1 million to drop the case, according to SMU attorney Mark Lanier, who said the lawsuit is an attempt to get more money out of the university. Vodicka said he wants his property back.